There is some confidence in the economy as reflected in the sales or turnaround in the Colombo Stock Exchange (CSE) during the first six months of this year, particularly the last three months. Dropping 200 marks within the first three months, ASPI (All Share Price Index) has gained 700 marks by the end of June, the overall ASPI to be around 6,700. The situation is still below the 2010-2011 level, when suddenly the CSE became the best stock market in the world in 2010, which could not be sustained due to the tarnishing of its image through insider trading and other malpractices, sanctioned by the last regime. If the situation is not to be cyclical, the government must take more positive action in rejuvenating the economy. Confidence in the economy would boost the CSE, and confidence in the CSE would boost the economy. The approval of the GSP+ is another factor for a cautiously optimistic future. If this is utilized properly, that can uplift the economy to a great extent. This is not limited to garments, but there are over 6,000 goods covered under this preferential facility. An added factor is the IMF’s approval of the third tranche of the Extended Fund Facility (EFF) of $ 167.2 million last week. It is hoped that with this grant, both the external reserve situation will be strengthened, and the exchange rate flexibility would be enhanced. This however is a loan and therefore it would increase the country’s external debt which is already high of around 34% of the GDP (out of overall 79%). Therefore, the rationale of this loan should be to increase the external revenue through exports, while debt servicing in the short run, without overwhelmingly depending on the remittances of the expatriate labour. We do have a lopsided situation in respect of our external (free) trade that has been the case under all past regimes. The following Table 1 reveals the adverse situation. In 2016, for example, we have imported $ 19,400 million of goods but exported only 10,310 million worth. The exports are only around 53 percent of the total imports. What has come to our rescue is the private transfers, bulk of which is from the expatriate labour. One can argue that expatriate labour is also an ‘export,’ but this is at a considerable human cost to the country both socially and economically. The country is increasingly facing shortages of skilled labour and also professionals. Of course, there are possibilities of ‘importing’ such labour from other countries, but the result would be the depletion of our foreign reserves, apart from other repercussions. Even with our ‘export of labour,’ the country has not been able to foot the bill of our imports. The deficit in the current account (C/A) balance has been worst in the years 2011-2013 due to ‘political consumerism,’ but the situation has not yet improved; 2016 making a deficit of $ 1,942 million. In the above context, complete free trade is highly questionable at least in the short term, if not in the long run. The answer undoubtedly is not a closed economy, but nuanced policies to offset the imbalances. There is a need to restrict/discourage certain imports which exacerbate the deficit or harm the local small industries and agriculture. Luxury vehicle importation is one, apart from completely scrapping of duty free vehicle licences for politicians and bureaucrats until the trade deficit is properly adjusted. Restrictions on liquor importation are another necessity. There can be higher tariffs for several other unnecessary goods coming into the country. Even in developed liberal countries, such measures are taken unless a country is within an open-border economic union (i.e. EU). There should be some protection for the agricultural sector, particularly given the growth being negative, amounting to -4.2 percent during 2016. This cannot be attributed solely to natural disasters like droughts and/or floods. These calamities should be anticipated even in the future. This author could remember travelling to Jaffna by road before and after the open economy was inaugurated in 1977. A clear difference was the disappearance of plush agricultural fields, probably onion and chilies, between Vavuniya and towards Elephant Pass. These sectors might not be resurrected, even with protection, as the war has changed the demography, occupations and life styles of the people in the northern province. However, there are peasants and farmers still in the northern, eastern, north central, Uva, southern and other provinces who need some care or protection for their agricultural products, until these sectors are modernized and made competitive with overseas markets. It is not total protection that is necessary, but nuanced safeguards. 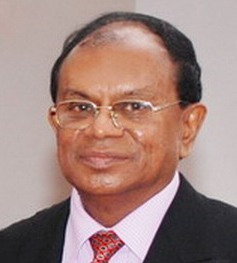 What is more necessary are intermediary industries like Lanka Canneries (MD) or Larich that can convert some of the agricultural products into exportable goods, however assuring a reasonable price to the primary producers. If they were to reach the overseas markets, like China or the Middle East, the tastes could be milder. There is space for other competitors. I remember such products coming from Jaffna before the war and not sure whether they survived. My emphasis on Jaffna or the North is that those economies have got devastated during the war, and resurrecting of them is necessary for both reconciliation and overall development. As I have previously suggested, there can be products like ‘Tea-Cola’ or ‘Mung-Mite’ like Vegemite or Marmite. It is a story in Australia that the growing middle classes in China even buying bottled ‘fresh air,’ as they have money to spend. Like the European markets under the GSP+, there can be market opportunities in China, Japan and India, even without strings! After the end of the war, there was an upsurge in the economy (2010-2012), but short lived. In 2012, the growth rate was 9.1 percent, which came down to 4.3 in 2013. The growth has not yet recovered to the required levels, the present administration also involved in too much politics, rather than economics. The growth rate last year was 4.4 percent. Although the growth rate is not the only indicator of economic progress or stagnation, it is a reasonable pointer. The upliftment of the economy, in terms of overall or per capita GDP, during the last decade, is mainly because of the hightide of the Asian resurgence, however making an extra-rich class in its wake and making the poor sections economically stagnating. For the present situation to be assessed properly, certain political factors need to be considered. There were political reasons why a political change was necessary in 2015. The primary reason was the 18th Amendment and the consequent authoritarian political developments. The political grip was kept within a family and a closed group, while allowing the governing politicians to misuse and virtually plunder the economy at various levels. That was one reason for the dip in the economy towards the end. It was, however, not merely about corruption, but also about misplaced (or lack of) economic policy and mismanagement. It was at the last moment that the so-called Yahapalana alliance was forged. Some of the consequences of that hasty or half-hearted formation are now visible. There were ideals and realities. There were genuine as well as opportunist elements behind the movement. The government that became formed was a bicephalic (two headed) animal, with the UNP and the SLFP. I am not saying that there is a big difference between the two, as far as the economic policies are concerned, yet, while the UNP has more confidence in the private sector, the SLFP might still emphasise the state sector under Maithripala Sirisena. In addition, the way the two parties are organized and their rank and file are concerned, there is obviously a conflict of interest. The major deficit of the national unity government, in my opinion, is the absence of a viable economic policy. It is still ambiguous. Without such a policy, political reforms might be in jeopardy. The political reforms have not progressed much beyond the 19th Amendment. The formulation of a new constitution has been slow and half-hearted, creating unnecessary opposition because of the delays among other reasons. Major crimes and fraud/corruption are not investigated as promised. Many promises have been given to the international community, without realizing the consequences of their implementation in the local context. In terms of the economic policy, what became declared was a ‘social market’ economy after suddenly coming into power. It is more of a concept or a vision than a concrete economic programme. While both the UNP and the SLFP may agree for ‘social justice,’ in addition to economic development, particularly influenced by late Ven. Maduluwawe Sobitha Thero’s movement, still there can be differences on the issues of ‘private sector vs state sector’ or ‘liberalization vs social welfare.’ Maithripala Sirisena, as the leader of the SLFP, has declared their policies to be ‘social democratic,’ whatever it means. Why Not Having Two Engines? After assuming duties, the current Minister of Finance, Mangala Samaraweera, declared the engine of growth to be the private sector. This is a traditional UNP policy. However, there is a SLFP section in the government with a different policy, although many of the old timers (including the old left) are still rotating around Mahinda Rajapaksa! Given the circumstances, or even otherwise, why not having two engines, instead of one? There are two major development paradigms, from the ‘West’ and the ‘East,’ although not purely distinct. One emphasizes the private sector, and the other, the state enterprises. Even in the West, ‘mercantilism’ preceded the ‘liberal’ industrial revolutions. Still on welfare issues, ‘social democratic’ regimes, or even others, rely on the public sector. Could the private sector deliver social welfare to the people? There can be some wishful thinking, but not practical, although the norms of good governance should apply to the private sector as well. The traditions in Sri Lanka are more of state-reliant. This may have to be changed or balanced, but not overturned. Take the example of SAITM issue. Already the Neville Fernando hospital is taken over (I wouldn’t say nationalized!). Sri Lanka may need to be pragmatic and take a middle path. Two engines may be better than one. There is no question that the state sector is inefficient and corruptible. This has to be changed. But who can say the private sector is not? Take the example of the central bank bond issue. In the modern world, the same/similar ‘business excellence’ models apply to the private sector as well as to public sector. Sri Lanka should take a leaf out of these developments. This is the critical last point. Prime Minister has announced a new wave of liberalization by the next budget 2018 (DailyFT, 20 July). That is all fine. A business-friendly environment is undoubtedly necessary to boost exports. Barriers to trade and productivity should be eliminated. Three-year economic policy statement would be unveiled, as reported. Although short of a ‘five-year economic plan,’ this is undoubtedly a welcome development. The PM has also not neglected the workers or the work force in his speech. He has also extended open arms to China, Japan and India while addressing the European Chamber of Commerce. That is the declared policy. However, in the website of his Ministry of National Policy and Economic Affairs under ‘Economic Policy Statement’ the following is what appears as a preface. It could be a distortion by the webmaster. However, it implies the strategy is only focused on India! It is also more than ambiguous, when it says, “Today our economy need no governance, yet a regulation.” Through experience, it is obvious that ‘good governance’ is necessary both in the public and private sectors. It is also wishful thinking to say, “aspiration for a prosperous country could be realized merely through more and more liberalization of the economy.” Necessary liberalization is fine, but not to repeat things like bond scams. If the idea is to achieve prosperity ‘merely’ through liberalization, it could also mean the complete neglect of the public sector, agriculture and welfare of the people. The government needs to clarify these matters. Well thought-of and written by Prof. Laksiri! **********However, “some protection for the agricultural sector,” should read “imperative mandatory protection for the agricultural sector.” Pity that life’s necessities have to go towards balancing budgets for the city-consumers. **************** [“Instead of a western megapolis, what might be necessary in the country is a series of ‘smart cities’ surrounded by ‘happy villages.’”]. Good scenario. But this might destroy the very basis and nature of rurality…..unless the smart towns are non-global in nature, and bent on the preservation of heritage and livelihoods. *************Who is going to bell the Luxury vehicle importation, it is wondered? Who is going to bell the brain drain, and money drain that is required for the brain-drain? The “Exports” section of the chart should be branched out and these shown as negative items. ************ [“Could the private sector deliver social welfare to the people?”]. Yes, they can. They have to pay due, mandatory taxes. It’s not social welfare. It’s the privilege of being allowed to actually commercialize in a country of long traditional lifestyles (quite different from US and Australia which destroyed all their farmlands to colonize, and hence needs to commercialize, and China which is purposefully destroying her farmlands to take over from the West). ************ [“In the modern world, the same/similar ‘business excellence’ models apply to the private sector as well as to public sector. 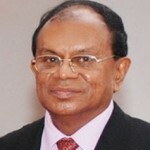 Sri Lanka should take a leaf out of these developments.”] Excellent suggestion! However, for Sri Lanka it should be about being 80-90% public sector (in accordance with our long-standing ancient heritage….credit to Sirisena, maybe). ************* [“Our economic strategy is focused on interacting with this giant economy in the Indian Ocean………… However, it implies the strategy is only focused on India!”]. Terrible thought, I agree. Mahinda Rajapakse govt had better balance on imports, exports and trade balance than the horapalana govt. Ranil wickramsinghe came boasted hims a s an economic expert. Ranil is running all over the world attending various economic summits. Yet, Laksiri Fernando says that 200 points i CSE decided everything. that @00 points simply can be market manipulation by the brokers for profits. What a dumb analysis. Politicatiticians trying to be economic analysts. That is why they have reduced exports to all the low levels at the time balligeputha rule ended up by 2015. You should be a born back licker not to have noticed this. Jim softy, pepole are no blind, they were the ones who chased away corrupted family from their sights, for all the high crimes and abuses by 2015. Leelagemalli: If the family is corrupt why the powerful govt which has western connections can not find the loot. the truth is politicians are the same even though the govts are different. So, if they catch even the one accused of Rajapakses will be caught. 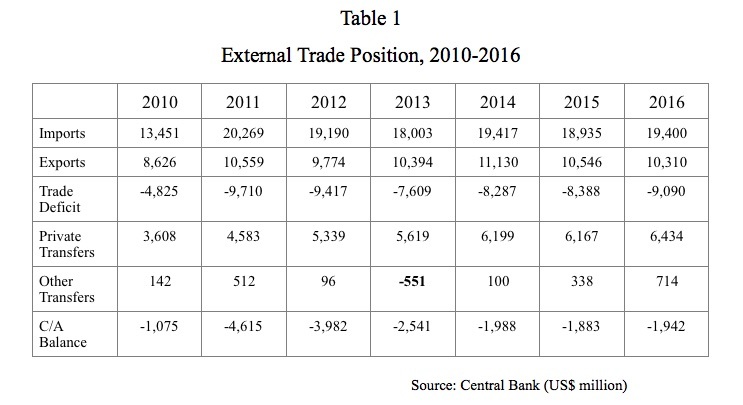 Analyse table provided by LAksiri Fernando and see how the imports, exports and trqade balance varied since 1911, IT looks this govt was not doing well and actually di dnot do anything even though Ranil wickramsinghe is economic expert and Central bank is under him. Now he got caught in his own negligence, carelessness and lack of initiative. Because, Central bank thieves are in both sides. Anyway, Laksiri Fernando’s economic analysis is crap and he did not prove that it was the previous which screwed it up. Are you really serious about this two engine concept? Engines are to generate power, in economic terms, generate wealth, products and services.. If we spend $10 for a chicken for food and others until it yield, and generate only $8, is it an engine or resource sink? Are SL Gov sector engines or power sinks, or black holes???? Greatest difficulty in modern human civilisation is to utilize the physical power and brain power of humans.. If we couldn’t use knowledge and physical skills of a human on today, this Monday, say for 8 hrs, we could never get it again… It is just wasted, gone ……. It is said productivity of SL workers is around 30%, this is including private sector employees.. What is the productivity of Gov employees along? Negative?? ?… This second engine you talk about Could be pure energy waste in third world countries like SL… In Japan, Korea, and West productivity go around 80% to 85% and in these countries Gov engines are not at completely loss, it has its purposes… You need to think about this two engine argument again… ….. When I was a Uni students, I remember Prof & lectures may be in the Uni for less than 20 hrs a week, then again what is the productivity of that 20 hrs. (There are hard working Profs and Gov workers too)… When I was doing higher studies abroad, I noticed most of Uni lecturers do solid 10 hrs a day and 50hrs per week.. Haven’t PhD guys learn that in the WEst and Japan.?? I am doing a personal project in a Uni in SL these days, things are worse now.. I get angry… but only thing I can do is spending more of my own time and do their job too… But when you talk with them, all those Profs, senior lecturers are overloaded, too busy… my a….ss…. I believe even SL gov, jobs of MPs and Minsiters should be outsourced, contracted … from private sector..
You re talking about MD and Larich. I heard those companies Indian and it is better for politicians to get cheaper everything from India as that fixes the ETCA too. What has to change is exceptional greed of politicians. They even import Rice from overseas. YOU talk about economical development while a bunch of corrupt politicians are on the saddle. The world economy is dynamic and “improving”. We are being dragged along with the tide but what we need is a step tsunami change. The pre-requisite for this is a conscious effort to root out as much as possible, the endemic corruption, nepotism and culture of impunity. There is no credible signs of this happening – certainly in the near future. Our seventy years of stagnation has roots in the political exploitation of the language/religion divide. Sorry for the pessimism Laksiri.